A few days ago, I asked the question, Is Google Aiming at Building Faster Networks and Data Transmissions? Google had acquired some interesting patent applications that have the potential to increase the speed and quality of data transmissions. An even more recent intellectual property acquisition by Google points to a growing interest in networking technology. Google is planning on bringing ultra high speed broadband access to Kansas City, with fiber optic cable connections between homes that Google promised will deliver 1 gigabyte-per-second speeds, or a speed that’s “20,000 times faster than dial-up and more than 100 times faster than a typical broadband connection!.” That’s pretty fast. According to the Official Google Blog post, Google may be in talks with other cities to bring them this kind of high speed internet access as well. The Google Fiber Blog hasn’t been updated too frequently, but may be something to watch. If Google is successful in Kansas City, it’s quite possible that they will be installing fiber elsewhere. So the question I have is where Google got the experience, the expertise, the knowledge, and the ability to embark on a project like this? I’m sure that they are hiring people specifically for the project, even more interestingly, it looks like they’ve taken some steps to make sure that they have the intellectual property in place to back up the project. On February 1, 2012, the United States Patent and Trademark Office recorded the assignment of 49 granted and 42 pending patent applications from Mosaid Technologies Inc., to Google, in a transaction executed on January 27, 2012. These patent filings appear to have originally belonged to Pirelli Cavi (the company’s name was changed to PGT Photonics S.P.A., The Pirelli Group, and now Prysmian), and cover a range of technologies related to fiber optic networks. 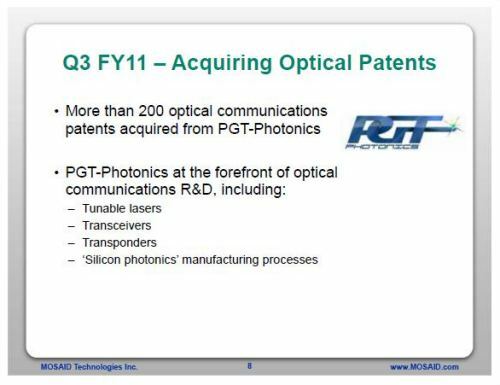 In their third quarter, Fiscal 2011 Presentation, Mosaid Technologies announced the acquisition of 200+ optical communications patents from PGT-Photonics. While Mosaid appears to have acquired more than 200 patent filings from Pirelli Cavi (PGT Photonics S.P.A.), the number of patent filings shown as assigned to Google in the assignment database at the USPTO total 91. Any patent filings that haven’t been published yet wouldn’t appear within that database, so there may be more involved as well. There are some very recently published pending patent applications and recently granted patents included in the transaction. The terms of the acquisition aren’t included in the USPTO database, and I couldn’t locate a single report anywhere on the transaction to learn more. Google is all about speed. Load time is becoming a major factor in page ranking. I just wish they would they start in Southern California instead of Kansas City! I have been telling people for years the the name of the game is not content it is the network. People are content thirsty the growth of video and high performance phones is creating a bottleneck at the network level. Google know dis google smart. This is a very extensive list of patents they are acquiring. What do you think this will do to the local ISP’s? I imagine it will force them out of business. Google is notorious for its R&D efforts in fields not necessarily related to its search engine. It comes as no surprise that they are working on providing internet at higher speeds than competitors. Google is so smart. I have to say, I am really impressed with how they keep reinvesting their profits in patents and what will ultimately be “future staple technologies”. They really seem to be taking the lead where the US government is not. And the fact that they are not simply sitting on store houses of cash (which wouldn’t do them any good any because money only has “perceived” value) shows that they actually “get it”. It will be interesting to watch the entire situation with this “against the grain” company unfold. Wow, Google is everywhere! I had no idea about this activity and frankly, I don’t feel reassured seeing this verticalisation that will eventually reach all topics/products/services related to the internet when the competitive advantage of Google (withou mentioning the financial powerhouse it is) is a huge entry barrier for new competitors. When I did work in the telecom industry I came across G’s network in the Oregon area, and presumed they were doing the same thing on a much broader scale. The first clue was a G rep purchasing inter-city “dark fiber” which will allow them to put their own lasers and electronics at regeneration points, G’s data centers, and other termination points – and create a G controlled inter-city system. The next clue was to visit the major telecom colocation centers in the city, and every site manager had to point out G’s room in their facility. With the CLEC craze of the late 90’s there is likely a lot of un-used fiber in all the major cities, just waiting for G to connect the local nodes. George Gilder wrote some interesting tomes on the virtually unlimited capacity of fiber optics, and I think G read his books! For a long time I have been saying that google has to move into the real world of IT to make it sustainable. Software is great and is their cash cow, but new sites can come along that eclipse the old (yahoo anyone). When they own the network and the biggest search engine then that is some real kind of monopoly. Makes you wonder how they choose where to throw their money and expertise now with some many staff and great ideas? And where are cisco etc in all of this? Isn’t this their kind of core business … makes you wonder how powerful Google can become and what the legislators are going to do next. I’m not sure that Google can handle all of the tasks and issues that come up on their own, especially if they decide to expand to other locations as well, and I see a chance for some local ISPs to collaborate and build upon what Google might offer. I did see a few days ago that a Chicago company took the step of buying a small ISP in Kansas City so that they could collaborate with Google on Google’s implementation of Fiber in the area. What is a little surprising is that they are expanding outside of their comfort zone in building a service that puts feet on the ground, requires customer support and service, involves hardware, and so on. Research is one thing. Will a project like this be something that they can handle? Maybe. I guess we wait and see. I suspect that they may have done some testing, and dipped their toes in the water in the past, but it seems like Kansas City is where they might prove that they can handle a project like this. Not sure about all of the factors that went into Google’s decision to start with Kansas City, but I suspect that it made sense to begin there, and maybe doing so outside of California was something they needed to do to show others that they were serious about being about to support a project like this in places that aren’t too close to their headquarters. Thank you. It is interesting seeing what direction Google will take next, and I agree that they aren’t standing still. The focus of the patent filings I’m seeing from them does seem to be changing. There are still a good number that focus upon search, but many are coming out about mobile devices and features and functions, and some hardware patents as well. There were a few news reports last fall that Google might be eyeing Europe for a fiber project as well, so I don’t think they are limiting what they are doing to the United States. I’m not sure of the scope of the project around Kansas City, except that while the project originally focused upon the part of Kansas City in Kansas, I know that it has been expanded to include the part of the City in Missouri as well. As for the other places that Google has talked with about Fiber, I don’t know which those might be other than what little information was provided on the Google Fiber blog. I’m not sure if Google’s lead in search will mean anything when it comes to how well they will do as an internet service provider. We have been seeing Google building its own servers and data centers for a few years, file systems that enable them to work with very large data sets, and so on. How much of the technical expertise that they’ve developed should they be sharing with others, or at least selling? Will they move into providing cloud services on a wider scale, or offering hardware and expertise to others? Should they be doing that? I don’t know. I don’t think Cisco is sitting back while this is happening. I do find it interesting that IBM has been actively assigning pending and granted patents to Google over the past couple of years, that in many cases involving servers and hubs and networking hardware. I really think that they are spreading themselves too thin. They want their hands in everything. Mobile payments, ISP, Google Green? I am not sure if they are even making money from all those services they provide. Sure they’ve got the advertising business to cover them all but Facebook is chipping away at their advertising. I think there is a risk of Google spreading themselves too thin, but ultimately with many of the areas that Google seems to be entering, their search service seems to be one of the potential winners. Mobile payments lead to coupons and offers and other ways for people to advertise other than just advertisements shown with search results or on Adsense publishers. Providing ISP services means that more people will be going online with broadband, and possibly become Google users. Google has been retiring some services, and cutting back on some of the things they offer, and maybe they have recognized that they need more focus.